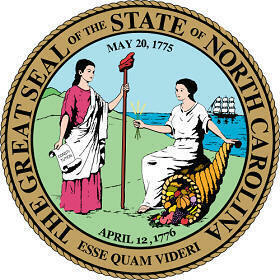 The North Carolina state seal identifies government buildings and officials. The symbolism, history and emblems of the North Carolina seal are described in this article. The Lady Liberty holds a staff topped by a liberty cap. The red stocking cap (the pileus, or Phrygian cap) was said to be worn in ancient Rome by slaves who had won their freedom. The Lady Liberty holds a scroll displaying the word "Constitution" in her right hand. 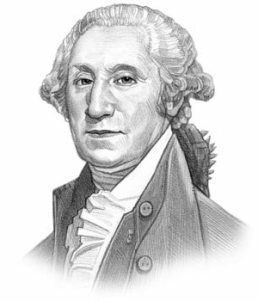 The North Carolina seal is kept and used as required by the Constitution and laws of the state. This is and early flyer containing the 1876 design of the North Carolina seal which is very similar to the modern version. The pictures on the flyer are interesting as they convey the lifestyle and industries in the early history of the state. Long Leaf Pines were abundant in the Coastal Plain region of North Carolina and lucrative industries emerged from products using the resin extracted from the trees. In 1850, North Carolina listed 444 tar and turpentine makers in the US Census, and over 1000 distillers were listed in state records. One picture illustrates a copper turpentine still and the other depicts men collecting resin in barrels that were placed at the base of trees.